01:10:00 Makes 16 servings, 2 Tbsp. each. Makes 16 servings, 2 Tbsp. each. Use leftover cranberry sauce to create a delicious sweet dip that kids are sure to enjoy! Beat cream cheese and cranberry sauce with electric mixer on medium speed until well blended. Gently stir in whipped topping; cover. Serve with strawberries, red and green grapes, pineapple or kiwi, cut into bite-sized pieces for dipping. 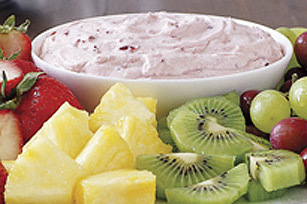 This dip is great spooned over individual servings of cut-up fresh fruit. Prepare as directed, using Philadelphia Light Cream Cheese and Cool Whip Light Whipped Topping. Serving Size Makes 16 servings, 2 Tbsp. each.